Through a partnership with the Alzheimer’s Association in Chicago, IL, 100 percent of NARFE-member donations go to Alzheimer’s research. The NARFE-Alzheimer’s National Committee, made up of one member from each of the NARFE’s ten regions, meet each year. With the help of experts from the Alzheimer’s Association, the Committee selects the research projects to fund. 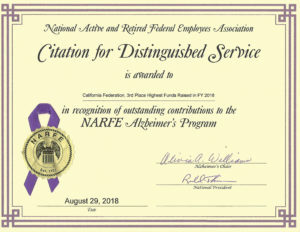 As of February 2019, cumulative NARFE donations to Alzheimer's Research is $13,038,482. Thanks to all of you for your fundraising efforts, we have met our goal of $13 million! We working our way towards our new goal of $14 million by the end of 2020. 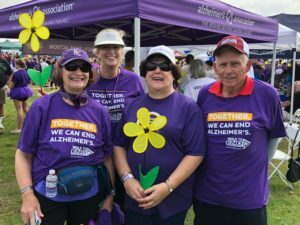 California Federation donations from our Chapters to Alzheimer's Research for the period July 1, 2018 to February 28, 2019, is $13,001. NARFE members - please keep up the generous donations and continue contributing at your Chapter meetings! Thank you for your support. NARFE CA Federation End Alzheimer's Walk Team. The walk occurred on Saturday, September 23 at Crown Point in San Diego. Members were from Chapters 0004 and 0669. Left to Right: Connie Vickers, Penny Doll, Barb Leetch and Bill Doll. Currently, the team as raised $1,285.